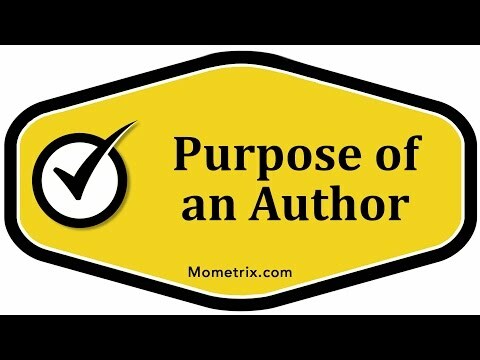 The purpose of an author is why the writer wrote the paper. It’s what motivated him to write something. There are three basic types of motivations or purposes of an author. They either wrote something to inform entertain or persuade. It’s important as a reader to understand the purpose of the author, because that helps you better understand the text. Generally, it’s pretty easy to determine what type of paper something is. An informative paper is basically when the reader or the writer is just giving the reader facts about something. They’re telling them more about something. A paper that is meant to entertain is generally fiction. Any kind of fiction work is meant to entertain. Occasionally, fiction will serve a double purpose of trying to inform and trying to persuade. Generally, when something is meant to entertain, it means that it’s some kind of fiction piece.Finally, the third purpose is to persuade. This is actually the hardest type to determine, because generally an author is going to try to hide that they’re trying to persuade you. When someone knows are trying to be persuaded, they’re going to be wary or skeptical of the arguments that the writer is throwing at them. A lot of times, a writer will try to disguise their persuasive paper as a paper that’s meant to inform or a paper that’s meant to entertain, but actually it’s meant to persuade the reader. Those are the three main types of purposes of an author: to inform, to entertain, or to persuade.